Hon’ble President laid the foundation of the new building of the Rashtrapati Bhavan Museum Complex, (RBMC) the Garages, on October 7, 2014. The name derives from the fact that the heritage building earlier housed the Garages of the President's Estate. After 21 months of diligent efforts by the Museum Advisor, officials and staff members, it is with immense pride that The Garages of RBMC is being officially inaugurated on July 25, 2016. The Garages showcase past as well as current Presidencies of the Rashtrapati Bhavan, the regal ceremonies, rich flora and fauna and much more. It is a complete package for visitors who may be keen observers of art, culture, heritage and history. The Garages has three floors, Ground Floor, Upper Basement and Lower Basement. The Ground Floor of the Garages has Photo spots and five major enclaves. The original Victorian Coach, a Luggage Coach and a Training Coach are also displayed on this floor. Enclave one is dedicated to Raisina Hill. Further divided into ten smaller enclaves, it shows the preconstruction terrain of the Raisina Hill, construction stages of the Rashtrapati Bhavan, current aerial view, Parliament House, the North Block and the South Block. 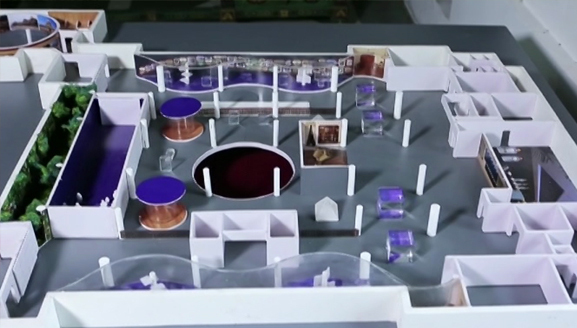 A scale model of Rashtrapati Bhavan with rubber silicon sculptures of the important people associated with its construction can be seen. Sketches, drawings and archival material related to Sir Edwin Lutyens and Herbert Baker is also a part of the enclaves. Visitors’ participation through interactive digital surface is integrated in the new building. Enclave two shows the Democratic Heritage and Welfare State in ancient India. Large FRP panels are used for displaying assemblies in ancient India (Mahabharata), self governing clans, people’s participation in public assembly halls, Ashok’s edicts and pillars, ceremony of dhamma, etc. Visitors’ participation through still/video clippings and flip books on digital surface is a part of the enclave. Enclave three showcases the Freedom Movement and Legislative Reforms of India. Through animated stage setting and interactive computer multimedia techniques, this enclave shows the important movements like the Nationalist Movement (1905-09), Morley-Minto Reforms, Jalianwala Bagh Massacre, Montague-Chelmsford Reforms, Non cooperation Movement, Purna Swaraj resolution in Lahore Congress, Civil Disobedience Movement, Government of India Act 1935, other reforms leading to freedom and finally the Freedom at Midnight. Audio narrations for each section are also available. Enclave four is related to the Indian Constitution. Right from drafting of the constitution by the drafting committee, to getting access to important articles and all pages of the constitution of India, this section has it all. Through Flip Book demonstration, visitors can get easy access. Exact replicas of the Constitution of India in Hindi and English are also displayed. Computer panels in this enclave give visitors an access to patriotic songs and movies in different languages. Enclave five highlights the Custodians of freedom, democracy and unity. This enclave has 11 smaller enclaves dedicated to the first Indian Governor General Shri C. Rajagopalachari and first ten Presidents of India. An integrated walk-through animated display showing their life, work, important contributions and more in is store for the visitors. Personal belongings like caps, shoes, pens, diaries and other items like favorite books, rare photographs and archival material make it an even more interesting trip for the visitors. A Heritage Block is also part of this floor which is dedicated to the architect of the Rashtrapati Bhavan Sir Edwin Lutyens and his collaborator Herber Baker. Original drawings of the presidential palace made by Sir Edwin Lutyens and original letters issued by him are put on display in this enclave. The drawings also include designs of chairs, bed, tables with baluster legs, details of sofa, large book case cabinet and more. Also on display in this section is a bust of Sir Lutyens. Various drawings by Sir Lutyens and Baker depicting their vision and ideas for the interiors and exteriors of the Bhavan are also displayed. One enclave displays the water colour paintings on Indian Sepoys by William Luker Jr.
Upper basement has a total of four enclaves. Enclave number six of the upper basement, is in continuation with enclave five on the ground floor. This one has a walk through central enclave dedicated to the current presidency. On side of the enclave is dedicated to Former President A.B.J. Abdul Kalam while the other side is earmarked for future presidencies. Enclave seven is dedicated for the Presidents of India. It has holographic projections, three dimensional busts of Presidents speaking to the visitors. This idea has been materialized by taking multi-dimensional video shots of living presidents and 3D computer imaging of other past presidents. This enclave also has videos kiosks on Presidents of India and selected Presidential gifts on display. Enclave eight is the Virtual Reality Enclave that allows visitors to walk out of Rashtrapati Bhavan with Mahatma Gandhi after the historic meetings like Gandhi Irwin Pact of 1931, the partition of India meeting of June 2, 1947 or the tea meeting with Governor General C Rajagopalachari. Enclave nine is based on Life in Rashtrapati Bhavan. It showcases multi screen panoramic projections reflecting the life inside Rashtrapati Bhavan. It has Presidents and first ladies, important events, oath taking, presidential award ceremonies, Silver Trumpet Ceremony, banquets, festivals and cultural programs and much more. Stage setting of the Kitchen in Rashtrapati Bhavan, preparation room in Rashtrapati Bhavan Kitchen, dining room all is included in this enclave. Collection of cooking utensils, crockery and cutlery are also exhibited here. Historic banquets are shown through digital platform. Nature in Rashtrapati Bhavan that includes, the trees, plants, landscape, small animals, birds with nests, bees, bugs and butterflies all in their natural habitat forms a part of Life in Rashtrapati Bhavan. Lower basement of the New Museum has on display various paintings and sculptures that were earlier displayed in the Marble Hall of Rashtrapati Bhavan. A digital screen projecting videos on important galleries of the world and a 3-D theater has also been incorporated in this floor of the Garages. Rashtrapati Bhavan Museum Complex is open for visitors on all days of the week except Monday. Timings are from 9 a.m. till 4 p.m.